This is entirely for me. If you happen upon it, welcome to my world. 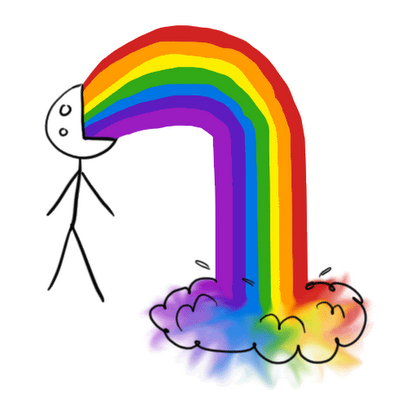 First, I cannot quite believe that there is an entire sub-culture of “Rainbow Puke.” It took me years to get to the place where I could sit down and begin typing this post…and I thought I owned the image (in my mind) of throwing up rainbows! What the hell! Am I too late? No. No one has the rights to throw up like I do. And rainbows, well….I have been into them all my life. So I, with clutching fingers and a defiant scrunched up pair of lips saying “NoNoNoNoNoNoNo” refuse to give it up. In the interest of sharing the rights…I might as well go ahead and post what I have found. I guess they did beat me to it. But, I will soon be procrastinating and fearing doing a painting of my own rainbow throw up. So stay tuned. I don’t know how to insert links or really how to do anything on wordpress yet. Like I said, I just started today. I moved over from blogger….where I made the big fat mistake of telling others that I had started a blog. As much as I love my mom, my therapist, my sisters and my boyfriend…I simply could not be myself there. So…in this blog I will be typing about my experiences in moving from the Dungeon to the Light. If you can relate, read on. If not, move along. HAhHAHAHAHHAhahHAHAAH! That actually made me smile big time. I guess I accept that description. 🙂 Thanks for reading!!!! I’m always ready for reading something that’s out of the box.